In his just released annual letter to shareholders, the CEO of the largest bank in America repeats a warning heard in recent months across this great land. When a political novice wins the U.S. Presidential Election with 84% of U.S. counties (2623 of 3112), it’s important to dig deeper than Russian hacking, there’s far more here than meets the eye. Hardly anyone has noticed, but in the fourth quarter of 2016 there was a surge in financial stress across America, a shift in financial conditions that may have had a hand in the election outcome. The cycle is turning, right before our very eyes. In recent months, we’ve found a substantial amount of evidence in capital markets pointing to credit formation reaching a saturation point. If you look at high quality prime loans, there’s more evidence of a credit event in December 2016. 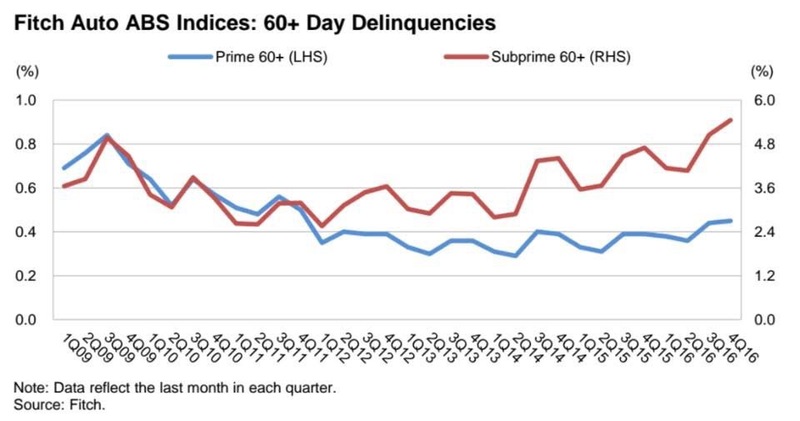 Across the board in consumer credit we witnessed spikes in credit card charge offs, auto loans gone bad, sour commercial real estate, student loans and an uptick (above) in Prime Mortgage Delinquencies. Every day, December 2016 is looking more and more like December of 2007. The credit deterioration has been sharp and swift. After auto loans, credit card receivables and commercial real estate; Commercial and Industrial loans is another area we have our eye on. This $2T segment of the U.S. financial system hit an air pocket during the last three months of 2016 with non-residential property financing in a 5.5% plunge, a rate of change to the downside not seen since 2008. Special thanks to the Telegraph for this chart. 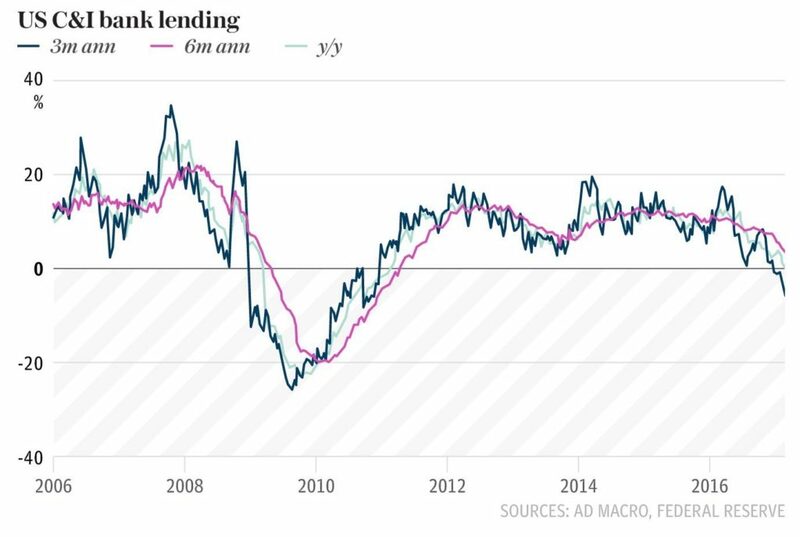 Corporate lending is in meaningful contraction as the U.S. Federal Reserve has finally initiated their rate hiking cycle. The Fed hiked rates for the third time in two years in March. Once again, central bankers are smoking in the dynamite shed, they’ve waited far too long to raise rates. They’re clearly tightening monetary policy into ugly credit deterioration. Listen to Economists or Data? In many spots around the economy, data is rolling over but the survey sentiment remains strong? Equity market’s hopes are pinned high on a economic shot of adrenalin from Washington, but a fumble (Paul Ryan’s Health Care Repeal and Replace failure) up on Capitol Hill has fiscal stimulus well over a year away in our view. This is looking more and more like a bridge too far. Do you think there’s a seasonal GDP problem here with the Atlanta Fed reading? For sure, Q1 has consistently been an under-performer over the last four years. As bond bulls in a sea of bears in 2015, we made a stand. Back then, Wall Street (consensus estimate from economists) was calling for ten Fed rate hikes in 2016-17. We argued, because of the colossal debt build 2006-2015, a small 25bps hike has the destructive power of three interest rate hikes. Above, the red line and circles represent recessions and the white line shows us M1 money supply growth. As banks pullback from lending M1 contracts, typically out in front of recessions. As you can see above, M1 has been trending lower since October’s 10.8% growth rate, to 8.1% in February. The good news is we’re far from the real danger zone for M1 growth. Ahead of the 2008, 2000 and 1990 recessions, each time M1 was negative 6-9 months prior to real economic stress. On the other hand, the U.S. economy heading in that direction, our model will be focused here in the months to come. 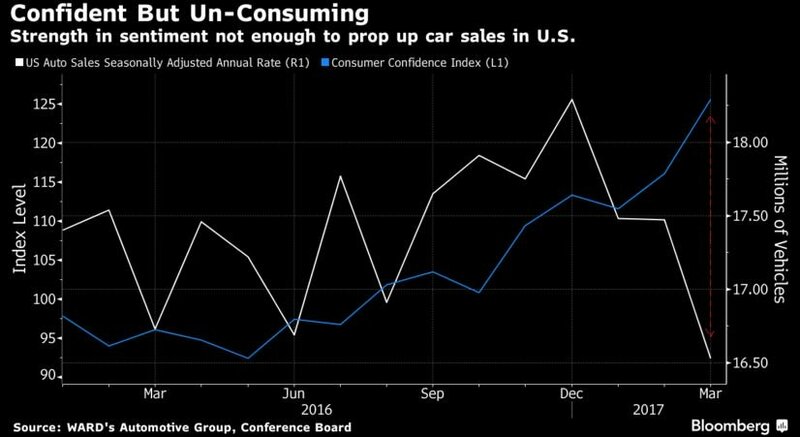 U.S. subprime auto lenders are losing money on car loans at the highest rate since the aftermath of the 2008 financial crisis as more borrowers fall behind on payments, according to S&P Global Ratings. Losses for the loans, annualized, were 9.1% in January from 8.5% in December and 7.9% in the first month of last year, S&P data released March 10, 2017. So, lets get this straight. We have an economy near full employment in what every economist on Wall St. calls a strong jobs market, with surging auto loan defaults? 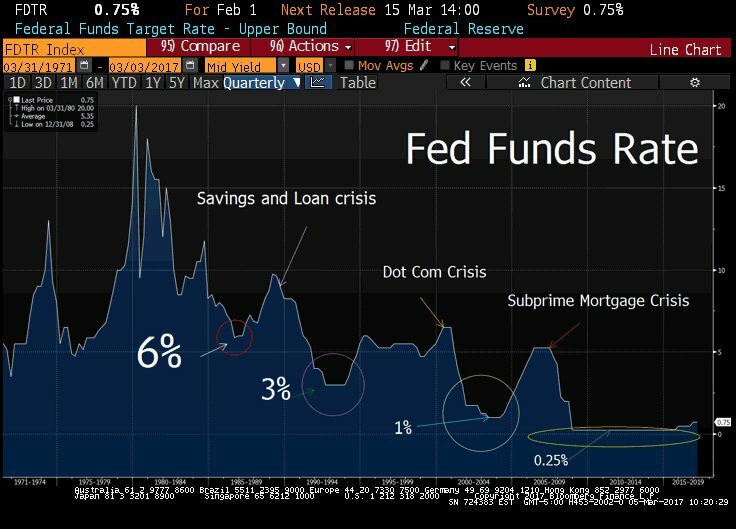 This is moral hazard gone bad, the Fed has kept interest rates so low for so long – the net result? We have an ugly, smelly pile of bad loans on our hands. In 2006, clueless economists lectured us “we cannot have a surge in home mortgage defaults with the labor market as strong as it is.” That was their “blind spot.” Trying to manage risk while looking at stale, traditional economic metrics, it’s pathetic. 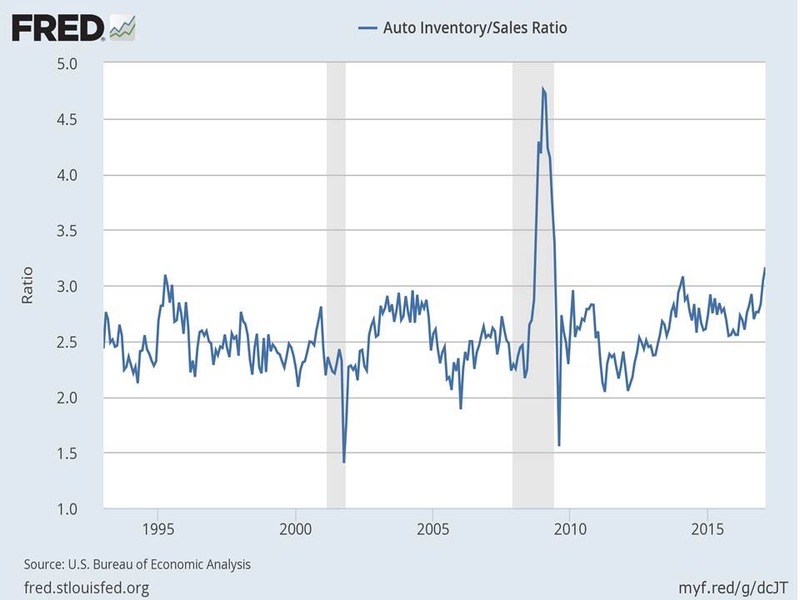 This is an eye opener, record supply level vs sales. It speaks to credit market saturation, sellers simply cannot find more “qualified” buyers. They’re reaching deeper into the risk spectrum. 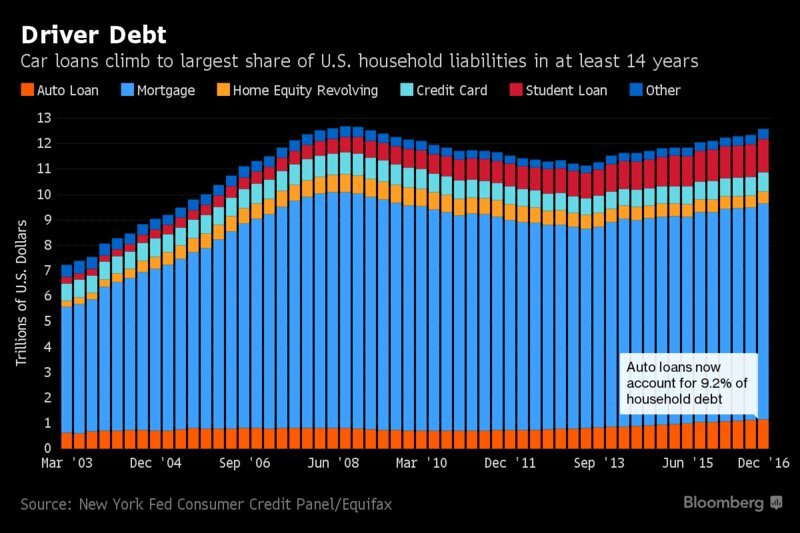 U.S. auto loans in the fourth quarter reached about 9.2% of all household debt, the highest share in data going back more than a decade. the average amount used to finance a new-car loan also reached a record $29,469, according to Bloomberg. To support sales growth and keep monthly car payments affordable, lenders have been lengthening the terms of loans to consumers — in many cases as long as seven years. It’s pure comedy, an asset that depreciates faster than a summer vacation is receiving longest term financing ever?! 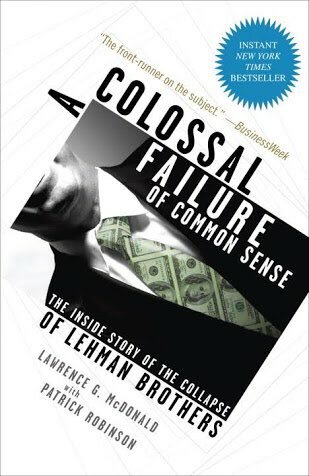 As central banks suppress the natural level of the cost of capital, a moral hazard oozes through capital markets. The bottom line, money ends up in places it just shouldn’t be as investors reach and reach and reach for yield. Interest rates should be used to price risk, today the risk-pricing mechanism hasn’t simply collapsed, it’s toxic. Ally Pain, Ally Financial Inc.
We’ve come full circle since “A Colossal Failure of Common Sense” (our 2009-10 global best selling book, now published in 12 languages). Over the last 100 years, after each financial crisis there’s a spectacular metamorphosis. It’s a transformation into another serpent, another beast and it’s powerfully depicted above. The mortgage market has “found religion,” only 6.8% of financing for new homes is subprime. Flowing down hill (thanks to Central Banks – Ben and Janet), the water has simply found its way to another location. Nearly nine years after Lehman’s failure, we’re seeing a substantial increase in risky lending in places like student loans, credit card and auto loans. Once again, credit card delinquencies should NOT be going up with the economy at full employment. Any first year economist out of college can tell you that, BUT they are. At some point when the Fed’s easy money policy reaches the saturation level in the economy, even with a decent jobs market, credit quality deteriorates. This is clearly happening now in our view. An early voice heading into the 2008 credit crisis, Chris Whalen is a man to listen to. He’s one of the best bank credit analysts from Wall St. We recap a section of his blog “Citigroup: Canary in the Coal Mine” below. 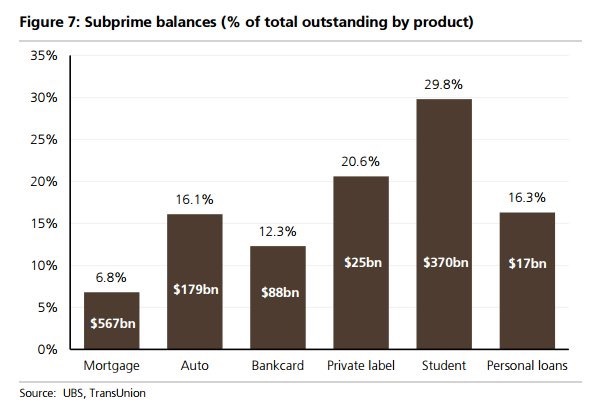 The final stage of credit deterioration’s saturation point is found in the shift over to “prime” or high quality borrowers. – Forecast range 110.0 to 118.0 from 69 estimates. – Present situation confidence rose to 143.1 vs. 134.4 last month. – Consumer confidence expectations rose to 113.8 vs. 103.9 last month. Why are Consumers So Confident? We’ve heard so much about record low approval rating for the Trump White House, but Consumers are singing a different tune. Tax Reform and Sky High Market Expectations, Why Should You Care? Minutes after their hopes of undoing Obamacare unraveled, the White House and top Republicans shouted from the rooftops (in careful coordination); they’re moving on to another ambitious goal — overhauling the U.S. tax code for the first time since 1986. The S&P futures ES1 opened down at 2331.75, just through last week’s low. Look for the bulls to defend this level overnight as the White House shifts gears on fiscal policy initiatives. Stocks in the U.S. suffered their worst week since the November election of Donald Trump. Investors turned to bonds as U.S. Treasuries rallied for the second week. Since early March, the S&P 500 is off 2.6% while bonds are nearly 4% higher in recent weeks. Coming into 2017, the policy execution bar was too high for the White House, equity markets are starting to price in a reality check on expectations. After the monster bond rally, the yield on the U.S. 10 year Treasury bond is down near 2.37%, while Wall St’s year end yield target is 3.25%. They’re piling out of U.S. Treasury shorts this morning as the “reflation trade” unwinds in a big way. Year after year we witness the same story. Wall St. crowds their clients into glorious theme trades. Each year, the road less traveled captures the honey pot. When you hear a heavily bought in consensus from this mob, run – don’t walk – the other way. Nearly all of Wall St’s “overweight” sectors for 2017 are underperforming this year. The much heralded “reflation trade” has been put on hold as markets rethink the upside of Washington policy’s impact. U.S. 10 year Treasury yield is through its hundred day moving average (see the green line above), the first time since October 4, 2016. The futures markets are currently pricing in 50% probability of a move by June, 115% probability of a move by September, and 155% probability of a move by the end of the year. A look at the Fed’s “Dots” (Fed governors public forecasts for interest rate direction) are currently projecting two additional moves this year, 31% more than what’s currently priced in. *from the December low to the Q1 high. It’s nothing short of pure comedy, Wall St’s been the gang that can’t shoot straight on bonds year after year. Each December, they’ve obnoxiously lectured investors about reasons to get out of bonds. They come up with pathetic themes to corral the masses; the “great rotation,” the “reflation trade” and “life after liftoff” focused on Fed policy and “higher interest rates.” This year it was Trump’s growth agenda, wrong again. Every year it’s been a different excuse to get out of fixed income securities. But so far in 2017, bonds, utilities, and defensive stocks have been the place to be. Euro’s Dominance in 2017, Came After a Pan from Wall St.
Wall St. was confident in December, they argued the ECB is in the middle of a $2.5T asset purchase program, while the Fed is hiking rates 3-4x, stay long the dollar. Wrong again. The dollar is at the same level is was during the week of the election of President Trump, it has given back all its gains. Join Our Team in Washington, ACG Analytics and the Bear Traps Report will host a policy call on Monday, March 27, 2017 at 10:00am ET. Implications of ACA Healthcare: Repeal Failure on the Trump Agenda: Our team will analyze what the future holds for Healthcare and Tax Reform and how competing interests in the GOP will affect the legislative environment of Trump’s first term. Some Wall St. analysts say corporate tax reform is now a happy meal not a big mac. In other words, only a much smaller plan will be able to get through Congress now as revenue neutral ambitions are far more challenging. As Washington policy execution stumbles, there’s an uneasy feeling creeping through in markets. The hole just got deeper, now up to $2T with the border adjustment tax BAT in trouble & ACHA savings gone. Bottom line, without key tax revenue offsets we’re looking at a corporate tax cut near 30-28%, not 20-15%. We noted in December in our Bear Traps Reports, the difficulty congressional Republicans have had in reaching consensus on the health legislation can very easily lead to a pullback from their lofty ambitions on tax reform. Bottom line: the more extreme reform ingredients of the House Republican plan on tax reform are more at risk today. Hot topics like the border adjustment and interest expense provisions that make up the destination based cash flow tax (DBCFT), will have far more uphill battle passing in an environment where near-unanimous support in the Senate will be necessary. *This is on top of the Street’s assumed 14% earnings growth based on economic, stock buy back and dividend payout forecasts. **Actual latest year (trailing four quarters to December 2016) GAAP earnings was $95.35, latest year “operating” earnings (removes “unusual” items) was $106.45 per Bear Traps and Bloomberg. As you can see, there’s 200-250 S&P handles tied to tax reform’s MEANINGFUL success. Without the “expected” earning growth from tax reform, the current 18 PE on the S&P is far higher, well above 20 in our view. We went through 12 different research reports from Wall St’s analysts, these are their best and worst case fiscal policy scenarios. **Assumes no fiscal policy action (tax reform, repatriation, infrastructure) and a reversion to the mean in near record high CEO, small business and consumer confidence. *Assumes full fiscal policy execution over the next 12 months (tax reform, repatriation, infrastructure, deregulation). On the positive side, you can see why markets are so pumped up on Trump. Sales growth found while looking at S&P 500 companies only grew at 1.9% during the mature years of the Obama economic recovery. This data is well below normal levels and speaks to substantial upside if “animal spirits” are fully embraced in the years to come. House leaders delayed a scheduled vote on their embattled health-care bill as conservatives mulled a deal proposed by the Trump administration aimed at winning Republican holdouts’ support. White House spokesperson and implies vote still scheduled for tonight. There’s some doubt if the vote is still on since there’s still no deal with Freedom Caucus. Markets were optimistic today’s discussions between the OMB Director and the head of the Freedom Caucus re: eliminating essential health benefit requirement under Obamacare would corral the necessary Freedom Caucus votes. But GOP moderates are beginning to defect now amid the uncertainty in what final healthcare coverage that produces. As moderates ultimately fall in line, the GOP still needs the entire Freedom Caucus. This put pressure on the White House to make a final offer. The GOP cannot afford to take this bill too far to the right, that will just kill its chances in the Senate. The chart of an obscure index is making its way around Wall Street. And some say that its recent surge suggests that traders are now more interested in protecting their portfolios from serious downside. That would be the CBOE skew index , which is near all-time levels. As the CBOE puts it, the index “measures the perceived tail risk of S&P 500 log returns at a 30-day horizon.” In other words, it represents an attempt to use options prices in order to determine the market-implied probability of a crash. Some have gone even further, suggesting that the chart shows investors are becoming more nervous about crashes, and that people are paying more to protect themselves against a “black swan” event that could be just over the horizon. Yet this thrilling story becomes a bit more prosaic once the skew index is brought under the microscope. The CBOE volatility index , or the VIX, has remained at notably low levels all year. This indicates that options traders remain confident that the S&P will not move too much. In fact, far from crash protection becoming more expensive, “tail puts are actually near their cheapest levels in the history,” Pravit Chintawongvanich of Macro Risk Advisors wrote in a derivatives strategy note Tuesday. 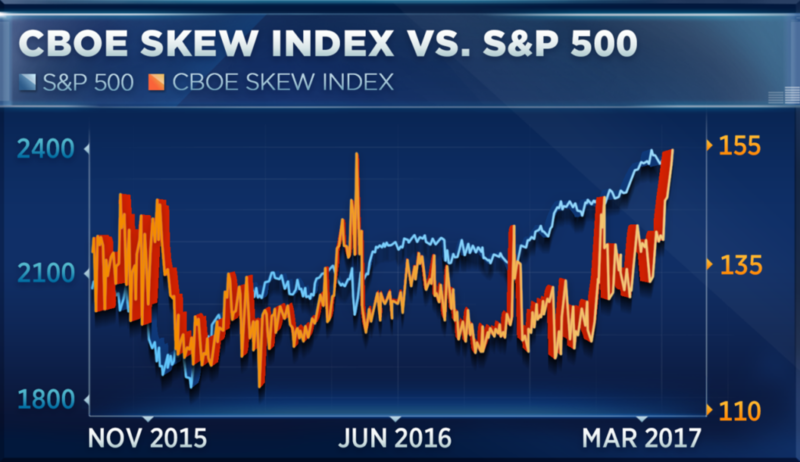 The skew index is accurately showing that these long-shot puts have become more expensive relative to ordinary puts and calls, but “that is missing the forest for the trees,” Chintawongvanich added. Since it actually measures something exceptionally narrow, “I don’t read into this index too much,” Weinig said. The index “certainly is meant to drive fear, but [its high level] can probably be explained by banks buying protection to protect against balance-sheet costs, or different type of relief like that,” he added. SKEW Surge, What Does It Mean? CBOE SKEW is the most significant since just before Brexit, clients this weekend we’re talking up this development and its implications. The Skew index as a measure of the slope of the implied volatility curve is as much a function of low implied volatility as it is a demand for cheap downside hedges given the low absolute premium. 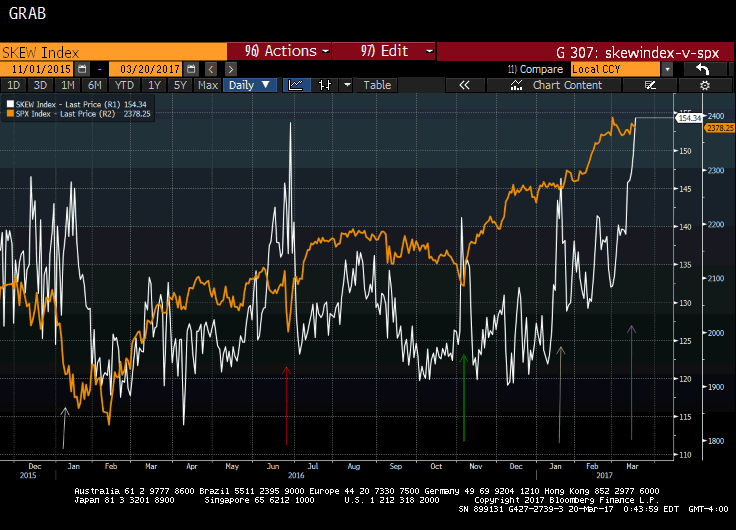 Note from attached chart over the last 15 months, SKEW index spikes (above) have tended to occur at interim market pull backs. Reasons for High SKEW today in the Market? 1. Too many market participants don’t trust the rally, want to buy out of the $ downside protection. 2. Too many have missed the rally, doubling down on downside protection. 3. Some are worried about a breakthrough in Washington, a deal on tax reform and health care, buying out of $ upside for a monster breakout. 4. Geopolitical Risk: North Korea vs Rex Tillerson, U.S. Secretary of State. Saber rattling this weekend and Friday. Some investors are worried about a US / Japan attack on N Korea. 5. Quarter End (Q1) a week from Friday: Investors trying to protect gains, they’re buying out of $ downside protection. U.S. equities are extremely rich to fundamentals, tooooo much riding on perfect Trump policy execution in Washington. U.S. Treasuries rallied in a big way this week. Today, data for March point to very tame inflation. Bond bulls argue the Federal Reserve could target for a even slower pace of interest rate hikes this year than it had forecast on Wednesday. Looking at this week’s Fed meeting, changes to economic forecast were very minor from their December gathering. This was was our view expressed to clients earlier this week. Some on the Street were looking for an uptick in the Fed’s near term inflation projections. The firm / specific statement that their inflation target is symmetric took the street by surprise. Too many market participants were bought into inflation fears. The Fed statement was modified to say that the committee looks for “sustained” return to 2% inflation. In other words, no concern of an overshoot. The very soft University of Michigan 5-10 year inflation expectations gave long term bonds a bid today. Number came in at 2.2% for March vs 2.5% from February. It’s now at the lowest level since the recording began. While this survey data point does not have the biggest sample size, it does speak to longer term inflationary pressures being overstated.